Juventus star Paulo Dybala claims that he does not have the greatest relationship with Lionel Messi. The former is regarded as the next great thing in the world football. It persuaded Juventus to pay €33 million for his services from Palermo. Dybala has been going through an extraordinary campaign with Juventus so much so that he has already been regarded as the successor for Messi. 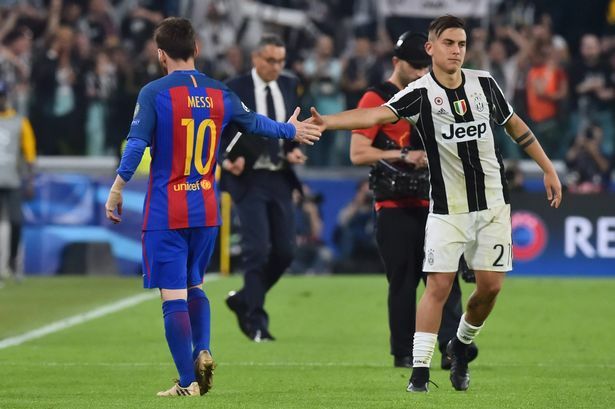 Both Argentines met each other in the Champions League quarter-finals, as Barcelona made the trip to Turin in order to play against Juventus. However, the game ended in a bad mood for one of the Argentines, as Lionel Messi’s Barcelona suffered a 3-0 defeat. Messi was unable to have any influence on the game while he watched 23-year-oldDybala dominate the game by scoring two goals.Dybala had an extraordinary 90 minutes which showed that he was certainly going to improve even further. After the game, the 23-year-old spoke about his relationship – or the lack of it – with Lionel Messi. Even though the pair are not friends,Dybala claimed that he has immense respect for the achievements of the Barcelona superstar. After having won numerous accolades in his career, the 29-year-old has also been able to win the most number of FIFA Ballon d’Or awards.The young forward came through the ranks at Instituto before joining Palermo in the summer of 2012. “He keeps himself to himself. We’ve not had a great relationship.I admire him a lot, I respect him. He’s won many Champions Leagues, me none and I dream of the first: I play for Juve and I want to win. On the pitch we are equals and I will do everything to beat him. People need to know that I am Dybala and I want to continue to be so. I understand the comparisons and the aspects of the Argentinians on me, but I don’t want to be the next Messi or the Messi of the future.There’s only one Messi, like [Diego] Maradona,” said Dybala.